Not a scan! Just a made up thingy! On 27th October, 1979, Malcolm McLaren and Adam Ant both attended the same wedding in London. Adam with his Ants had just recorded & released the brilliant “Dirk wears white sox” album. So Malcolm got talking to Adam, asking about what was happening, known Adam had just split the band. They chatted for hours and 6 weeks later Malcolm & Adam had agreed a management deal. Malcolm gave Adam a mix tape of 17 songs to help him understand the construction of songs and seek a style which would, as Adam states in his autobiography, “eventually evolve as Antmusic”. Of course, Adam Ant plays Dublin on 25 November, 2011. 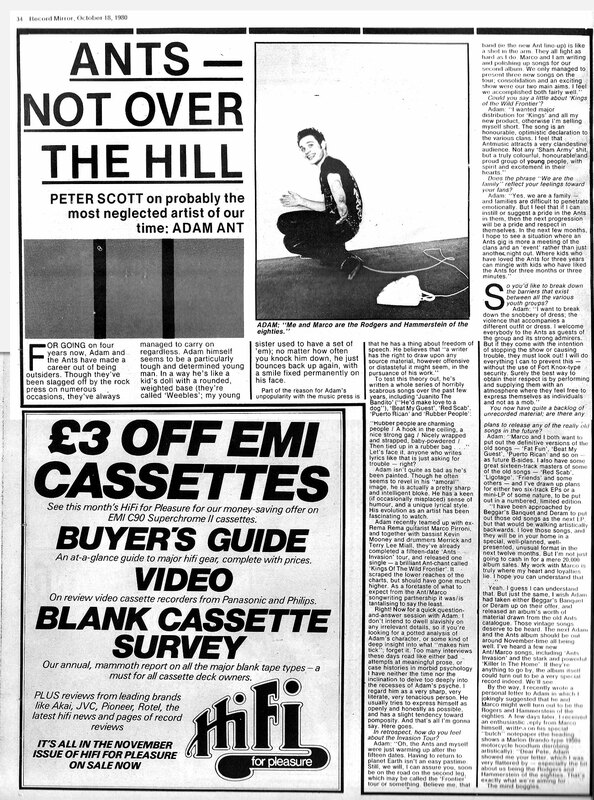 I’ve also scanned in an interview with Adam Ant from Record Mirror, October 1980. By this stage, Adam had split with Malcolm, teamed up with Marco and the single “Kings of the Wild frontier” had just been released. It initially just reached the lower end of the charts, but things were all set to explode and take Adam into a whole new dimension. See other post: Adam & the Ants, Lyceum, 1979. Thank you for posting this. Always wanted to hear Burundi Black. Never occurred to me to look on You Tube!! Thanks for comment, R2D2Antics! I put the tracks in the order that Adam had listed them in his autobiography. The Burundi Black was last in the list but is by far the most significant track. The first album I ever bought. Adam Ant. I used to be embarassed but now, thanks to you, Dougie, I see that it was subversive post-modern irony from the bould Malcolm. I’m saved! ‘Hot Dog’ is by Buck Clayton; Taps Miller is the vocalist.